South Bay-based director Bill Riead, seated left, is flanked by cast and crew members from his full-length feature film, "Broken Vows." Seated to his right is editor Olaf Kallstom. 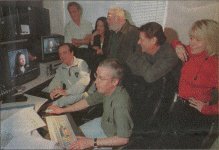 Standing from left to right: executive producer Corky Barton, actress Olivia Hussey, actor Ed Asner, producer Jack Green, and Riead's wife and prducer, Lisa Riead. When discussing writer, producer and director Bill Riead's latest film, you might as well hold on tight because the man's galeforce imagination, insight and energy come on like a tornado. Since graduating from college in 1969, the Rolling Hills Estates resident's quest to become a filmmaker has taken him from the front of the camera as a TV news reporter to a behind-the-scenes video director for Columbia Pictures. Now Riead is putting the final touches on his first full-length feature, "Broken Vows,” filmed in the South Bay and on Catalina Island. He recently assembled lead actors Ed Asner and Olivia Hussey and other coworkers in his newly constructed edit bay in Malaga Cove to view the final cuts. The first public screenings are planned for midsummer. "You have to see this before Olivia gets here," Riead said as he shoved a videotape into a player in his octagon-shaped office last week. "Olivia Hussey is a gifted actress who can cry on cue. I asked her to give me a tear, and she said in her crisp British accent, 'A tear? Which eye?' "Without hesitation, the president and CEO of Riead Productions Corp. gives his cast and crew, along with the South Bay scenery, credit for the successful venture. The city of Palos Verdes Estates in particular bent over backward for him, he said. Riead's screenplay attracted such Hollywood notables as Asner, Hussey, Tony Denison, Don Murray and Jerry Hardin – all of whom jumped at the chance to appear in the film. The full-length suspense-thriller was made in about four weeks because he delegated jobs he knew would be carried out correctly and hired the kind of actors and producers who don't have to do 100 takes, he said. "Jack Green is a top, top director of photography who shot 'Twister,' the 1992 Academy Award [winning] 'Unforgiven' and almost all of Clint Eastwood's films for the last 30 years," Riead said as Green, a soft-spoken, unob-trusive-type', blushed at the enthusiastic compliments. "We are making a top-quality motion picture, sparing nothing, with a price the Hollywood studios would drool over – and we all love the South Bay." Dressed in wire-rim glasses, a green-suede jacket, brown oxford-type wingtips and sporting a beard for his next movie, Asner traded brusque but affectionate quips and puns with Riead. Asner called Riead "an efficient machine," an enormously gratifying trait for performers who are used to keeping pace when production sometimes becomes "constipated," he said. "We were all prepared for this movie – even Bill – and he lead well, issuing edicts and commands – all the time," Asner said. "It was his way of getting the job done – you take it in stride because that’s what makes him efficient,"
Hussey, a mother of three, has been on a self-imposed hiatus raising her youngest daughter with husband David Eisley. The star of Franco Zef-firelli's famed "Romeo and Juliet" said helping Riead carry out his vision made coming back to work easy. If making "Vows" hadn't been so fun, she would have quit filmmaking completely, she said. "I trust Bill so completely that I would say yes to his next film without having read it," Hussey said.